Anthony David Leighton Scott (21 June 1944 – 19 August 2012) was an English film director and producer. He was known for directing action and thriller films such as Top Gun (1986), Beverly Hills Cop II (1987), The Last Boy Scout (1991), True Romance (1993), Crimson Tide (1995), Enemy of the State (1998), Man on Fire (2004), Déjà Vu (2006), and Unstoppable (2010). San Pedro, Los Angeles, California, U.S.
Hollywood Forever Cemetery, Hollywood, California, U.S.
Scott was born in Tynemouth, Northumberland, North East England, the youngest of three sons of Elizabeth (née Williams) and Colonel Francis Percy Scott (who served in the Royal Engineers). Scott's great uncle Dixon Scott was a pioneer of the cinema chain; opening cinemas around Tyneside. One of Dixon's cinemas, Tyneside cinema, is still operating in Newcastle. It is also the last remaining open newsreel cinema operating in the United Kingdom. He followed in his elder brother's footsteps, studying at Grangefield School, West Hartlepool College of Art and graduating from Sunderland Art School with a fine arts degree. At the age of 16 he appeared in Boy and Bicycle, a short film marking the directorial debut of his 23-year-old brother Ridley. Scott studied art in Leeds after failing to gain admission to the Royal College of Art in London at his first attempt. He made a short film in 1969 based on the Ambrose Bierce story One of the Missing. As Ridley had previously cast him in a film, he reciprocated by giving his brother a role too. "The film cost £1,000", he recalled in April 2012. Whilst at the Royal College of Art, where he was taught by Raymond Durgnat, he starred in "Don't Walk", a film by fellow students Hank Onrust and Richard Stanley: the film credits state it was "made for BUNAC by MARCA films at the Royal College of Art". He graduated from the Royal College of Art, following in the footsteps of his elder brother Ridley, with the intention of becoming a painter. His eldest brother Frank had earlier joined the British Merchant Navy. Next for Scott came Domino (2005) starring Keira Knightley. In autumn 2006, Scott reteamed with Denzel Washington for the sci-fi action film Déjà Vu. Scott once again teamed up with Denzel Washington on The Taking of Pelham 123, which also starred John Travolta and was released in cinemas on 12 June 2009. The film was a remake of the 1974 film of the same title. 2009 also saw the debut of The Good Wife, a legal drama television series which had Scott and his brother as two of several executive producers. In 2010, the Scott brothers produced the feature film adaptation of the television series The A-Team. Scott's film, Unstoppable, again starring Washington (with Chris Pine), was released in November 2010. Shortly before his death he produced Coma, an A&E miniseries, the Coca-Cola short film The Polar Bears and the thrillers Stoker and The East, both with his brother. Manohla Dargis of The New York Times wrote that Scott was "one of the most influential film directors of the past 25 years, if also one of the most consistently and egregiously underloved by critics" and called him "[o]ne of the pop futurists of the contemporary blockbuster." She felt that "[t]here was plenty about his work that was problematic and at times offensive, yet it could have terrific pop, vigor, beauty and a near pure cinema quality. These were, more than anything, films by someone who wanted to pull you in hard and never let you go." Owen Gleiberman of Entertainment Weekly wrote that "the propulsive, at times borderline preposterous popcorn-thriller storylines; the slice-and-dice editing and the images that somehow managed to glow with grit; the fireball violence, often glimpsed in smeary-techno telephoto shots; the way he had of making actors seem volatile and dynamic and, at the same time, lacking almost any subtext" were qualities of Scott's films that both "excited audiences about his work" and "kept him locked outside the gates of critical respectability." Scott married three times. His first marriage was to BAFTA Award winning TV production designer Gerry Boldy (1944–2007) in 1967. They were divorced in 1974. His second marriage was in 1986 to advertising executive Glynis Sanders. They divorced a year later when his affair with Brigitte Nielsen (married to Sylvester Stallone at the time), whom he met on the set of Beverly Hills Cop II, became public. He subsequently met film and TV actress Donna Wilson, who was 24 years his junior, on the set of Days of Thunder in 1990; they married in 1994. She gave birth to their twin sons, Frank and Max, in 2000. On 19 August 2012, at approximately 12:30 pm. PDT, Scott killed himself by jumping off the Vincent Thomas Bridge in the San Pedro port district of Los Angeles. Investigators from the Los Angeles Police Department's Harbor Division found contact information in a note left in his car, parked on the bridge, and a note at his office for his family. One witness said he did not hesitate before jumping, but another said he looked nervous before climbing a fence, hesitating for two seconds, and jumping into the water beside a tour boat. His body was recovered from the water by the Los Angeles Port Police. On 22 August, Los Angeles County coroner's spokesman Ed Winters said the two notes Scott left behind made no mention of any health problems, but neither the police nor the family disclosed the content of those notes. In a November 2014 interview with Variety, Ridley Scott, while describing his brother's death as "inexplicable", contradicted the coroner's official by saying that Tony had been "fighting a lengthy battle with cancer — a diagnosis the family elected to keep private during his treatments and in the immediate wake of his death." A family press release on 22 August 2012, stated that "The family will announce plans after Labor Day for a gathering to celebrate the life and work of Tony Scott. Details will be forthcoming once they are formalised." The family announced that they had established a scholarship fund at the American Film Institute in Scott's name, stating, "The family ask that in lieu of flowers, donations be made to the fund to help encourage and engage future generations of filmmakers." He was cremated, and his ashes were interred at Hollywood Forever Cemetery on 24 August in Los Angeles. Subsequently, it was reported that he had left his estate to his family trust. He is survived by his wife, Donna Wilson Scott, their twin sons, and his brother, film director Ridley Scott. Many actors paid tribute to him, including Tom Cruise, Christian Slater, Val Kilmer, Eddie Murphy, Denzel Washington, Gene Hackman, Elijah Wood, Dan Kook, Dwayne Johnson, Stephen Fry, Peter Fonda and Keira Knightley, as well as musical collaborators Hybrid. Cruise stated, "He was a creative visionary whose mark on film is immeasurable." Denzel Washington, Scott's most frequent acting collaborator, said, "Tony Scott was a great director, a genuine friend and it is unfathomable to think that he is now gone." Directors UK chairman Charles Sturridge commented, "Tony Scott was a brilliant British director with an extraordinary ability to create energy on screen, both in action and in the creation of character." 1969 One of the Missing Yes No Short. Also writer, cinematographer and editor. 1970 Loving Memory Yes No Mid-length. Also writer, cinematographer and editor. 1976 The Author of Beltraffio Yes No Mid-length. Produced for the French television anthology series Nouvelles de Henry James. 2002 Beat the Devil Yes Yes Short. Executive producer. 2004 Agent Orange Yes No Short. 2012 The Polar Bears No Yes Short. ^ "Outstanding British Contribution To Cinema". BAFTA. 13 October 2015. ^ Sullivan, Michael (17 September 2010). "BAFTA/LA to honor Scott Free Prods". Variety. Reed Elsevier Inc. Retrieved 31 July 2012. ^ "Anthony D L Scott: England and Wales Birth Registration Index". Family Search.org. ^ "Tony Scott: tragic illness behind Top Gun director's suicide" (20 August 2012). Retrieved 13 March 2015. ^ a b Blankenstein, Andrew; Horn, John (19 August 2012). "'Top Gun' director Tony Scott jumps to his death from L.A. bridge". Los Angeles Times. Archived from the original on 20 August 2012. Retrieved 20 August 2012. ^ "How Winston helped save the nation". The Scotsman. 6 July 2002. Archived from the original on 20 August 2012. Retrieved 20 August 2012. ^ "Tony Scott". The Telegraph. London. 20 August 2012. Retrieved 20 August 2012. ^ a b c Galloway, Stephen (22 August 2012). "Tony Scott's Unpublished Interview: 'My Family Is Everything to Me'". The Hollywood Reporter. Retrieved 25 August 2012. ^ Ridley Scott's comment on The Directors—The Films of Ridley Scott. ^ Harper, Tom; Jury, Louise (20 August 2012). "Hollywood pays tribute to Top Gun director Tony Scott following suicide leap". Evening Standard. Retrieved 5 September 2012. ^ a b c Rich, Katey (12 June 2009). "Interview: Tony Scott". Cinema Blend. Retrieved 20 August 2012. ^ White, James (20 August 2012). "Tony Scott Dies". Empire. Retrieved 24 August 2012. ^ a b c d e f Makinen, Julie; Boucher, Geoff (20 August 2012). "Tony Scott dies at 68; a film career in retrospective". The Los Angeles Times. Archived from the original on 20 August 2012. Retrieved 20 August 2012. ^ "Tony Scott Obituary". The Guardian. ^ Wicks, Kevin (20 August 2012). "British Director Tony Scott Dead in Apparent Suicide at 68". BBC America. Archived from the original on 20 August 2012. Retrieved 20 August 2012. ^ a b "Jets, jeans and Hovis". The Guardian. 12 June 2015. ^ a b "Obituary: Tony Scott". BBC News. 20 August 2012. Retrieved 21 August 2012. 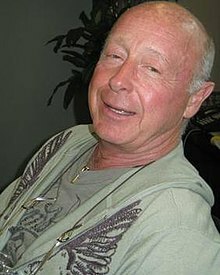 ^ a b c "Authorities say 'Top Gun' director Tony Scott dies after jumping off Los Angeles County bridge". The Washington Post. Associated Press. 19 August 2012. Archived from the original on 20 August 2012. Retrieved 20 August 2012. ^ Shoard, Catherine (20 August 2012). "Tony Scott: a career in clips". The Guardian. London. Retrieved 21 August 2012. ^ "Numb3rs Season 4, Episode 1: Trust Metric". Internet Movie Database. Archived from the original on 20 August 2012. Retrieved 20 August 2012. ^ "Domino". Internet Movie Database. Archived from the original on 20 August 2012. Retrieved 20 August 2012. ^ "Déjà Vu". Internet Movie Database. Archived from the original on 20 August 2012. Retrieved 20 August 2012. ^ "The Taking of Pelham 1 2 3". Internet Movie Database. Archived from the original on 20 August 2012. Retrieved 20 August 2012. ^ "Full Cast and Crew for 'The Good Wife'". Internet Movie Database. Archived from the original on 20 August 2012. Retrieved 20 August 2012. ^ "The A-Team". Internet Movie Database. Archived from the original on 20 August 2012. Retrieved 20 August 2012. ^ "Unstoppable". Internet Movie Database. Archived from the original on 20 August 2012. Retrieved 20 August 2012. ^ Marroquin, Art (19 August 2012). "BREAKING: Film director Tony Scott jumps to his death from Vincent Thomas Bridge". Los Angeles Daily News. Archived from the original on 23 August 2012. Retrieved 20 August 2012. ^ Fleming, Michael; Bensinger, Ken (17 November 2003). "'Pancho' in Mexico mix". Variety. Retrieved 25 August 2012. ^ a b Collura, Scott (16 November 2006). "Helmer Talks Warriors Remake". IGN. Retrieved 25 August 2012. ^ Bunbury, Stephanie (16 April 2005). "Nicole enters movie maelstrom". The Age. Australia. Retrieved 25 August 2012. ^ Alter, Ethan (23 October 2006). "SCOTT, TONY". Film Journal International. Retrieved 25 August 2012. ^ a b c McClintock, Pamela (20 August 2012). "Tony Scott Spent Final Days Working With Tom Cruise on 'Top Gun 2'". The Hollywood Reporter. Retrieved 25 August 2012. ^ Rich, Katey (20 August 2012). "Remembering Tony Scott, In His Own Words". Cinema Blend. Retrieved 20 August 2012. ^ a b Dargis, Manohla (20 August 2012). "A Director Who Excelled in Excess". The New York Times. Retrieved 25 August 2012. ^ Gleiberman, Owen (21 August 2012). "Was Tony Scott a good director? It depends on what your definition of good is". Entertainment Weekly. Retrieved 25 August 2012. ^ a b McCarthy, Todd (22 August 2012). "Todd McCarthy: How Tony Scott Finally Won Me Over". The Hollywood Reporter. Retrieved 25 August 2012. ^ Sharkey, Betsy (24 August 2012). "Tony Scott, a man of action who brought out the best in his men". The Los Angeles Times. Retrieved 25 August 2012. ^ Stafford-Clark, Nigel (12 May 2007). "Obituary: Gerry Scott Foulds". The Guardian. London. Retrieved 27 August 2012. ^ Hough, Andrew; Allen, Nick (20 August 2012). "Top Gun director Tony Scott dies after jumping from Los Angeles bridge". The Telegraph. London. Retrieved 16 October 2012. ^ "Hollywood pays tribute to Top Gun director Tony Scott following suicide leap". London Evening Standard. 20 August 2012. Retrieved 27 August 2012. ^ Andy Jessop (20 August 2012). "Tony Scott Dies After Bridge Plunge by Andy Jessop of Lifestyle Uncut". Lifestyleuncut.com. Retrieved 24 August 2014. ^ a b Blankstein, Andrew (19 August 2012). "'Top Gun' director Tony Scott dead after jumping off bridge". The Los Angeles Times. Retrieved 20 August 2012. ^ "Tony Scott, Director of 'Top Gun,' Dies in Apparent Suicide". The Wrap. The Wrap News Inc. 19 August 2012. Retrieved 7 February 2013. ^ Geier, Thom (20 August 2012). "'Top Gun' director Tony Scott dies at age 68 in apparent suicide". Entertainment Weekly. Archived from the original on 20 August 2012. Retrieved 20 August 2012. ^ Louise Boyle (19 August 2012). ^ "Tony Scott Laid to Rest in Los Angeles". The Hollywood Reporter. 24 August 2012. Retrieved 26 August 2012. ^ Winton, Richard; Blankstein, Andrew (25 August 2012). "Tony Scott death: Director laid to rest as questions remain". The Los Angeles Times. Retrieved 27 August 2012. ^ "Antidepressant, Sleep Aid Found in Director Tony Scott's Body". The Daily Beast. Retrieved 23 October 2012. ^ "Director Tony Scott had no serious medical conditions, coroner says". Los Angeles Times. 22 October 2012. Retrieved 23 October 2012. ^ Scott Foundas (25 November 2014). "Exodus: Gods and Kings' Director Ridley Scott on Creating His Vision of Moses". Variety. Retrieved 28 December 2014. ^ Miller, Daniel (22 August 2012). "Tony Scott Funeral Plans and Memorial Announced". The Hollywood Reporter. Retrieved 26 August 2012. ^ Miller, Daniel (27 August 2012). "Tony Scott Family Establishes AFI Scholarship". The Hollywood Reporter. Retrieved 28 August 2012. ^ "Tony Scott's Will Leaves Entire Fortune to Wife and Kids". TMZ.com. 21 September 2012. Retrieved 16 October 2012. ^ "Tony Scott". NNDB. Retrieved 20 August 2012. ^ a b "Tom Cruise leads tributes to director Tony Scott". BBC News; retrieved 21 August 2012. ^ "Hollywood reacts to the death of Tony Scott", Associated Press; retrieved 21 August 2012. ^ "Film Director Tony Scott: In Remembrance". Hybridsoundsystem.com. 21 August 2012. Archived from the original on 15 October 2012. Retrieved 16 October 2012. ^ "Tony Scott dies aged 68", DirectorsUK.com; retrieved 29 August 2012. ^ "Golden Globes 2016 ceremony – in pictures". The Guardian. 9 February 2016.